Since ESP8266 is now so popular, I’ve recently bought a NodeMCU board to try it. I selected this board because the latest version of the board is breadboard-friendly, integrates a USB to serial chip, and it can be powered by a simple USB to micro USB cable. 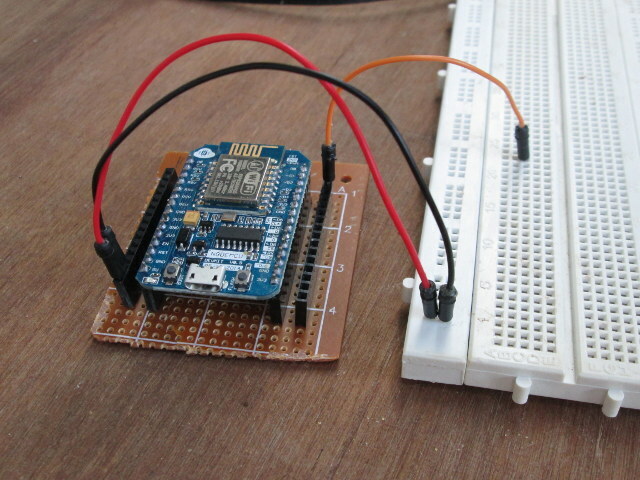 I also noticed a ESP8266 tutorial with NodeMCU firmware by SwitchDoc Labs the other day (using ESP-12 and Adafruit Huzzah), which I applied to my NodeMCU board, but since I encountered a few issues, I decided to report my findings, and write my own little getting started guide to switch on/off LED and GPIOs using a web interface. The main complain about NodeMCU v0.9 is that while it fits on the breadboard, you can’t use as it takes the full width of the board, while NodeMCU v1.0 is really breadboard-friendly as you can see on the right part of the picture above. Other differences are that NodeMCU v1.0 has some extra GPIOs. 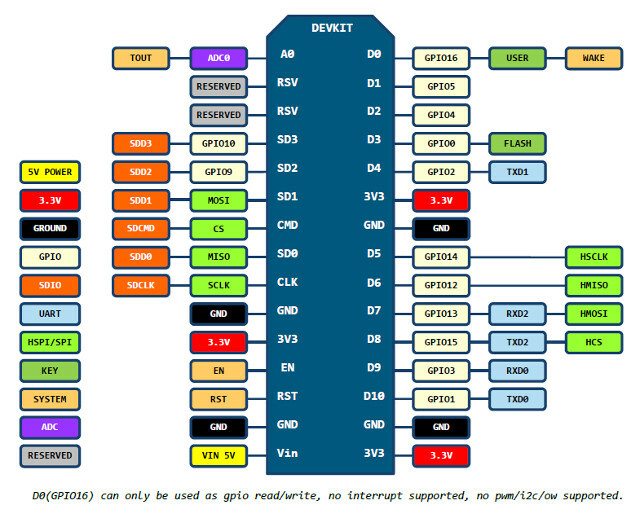 Please find the pinout for both versions below. We’ll use these a little later in this tutorial. 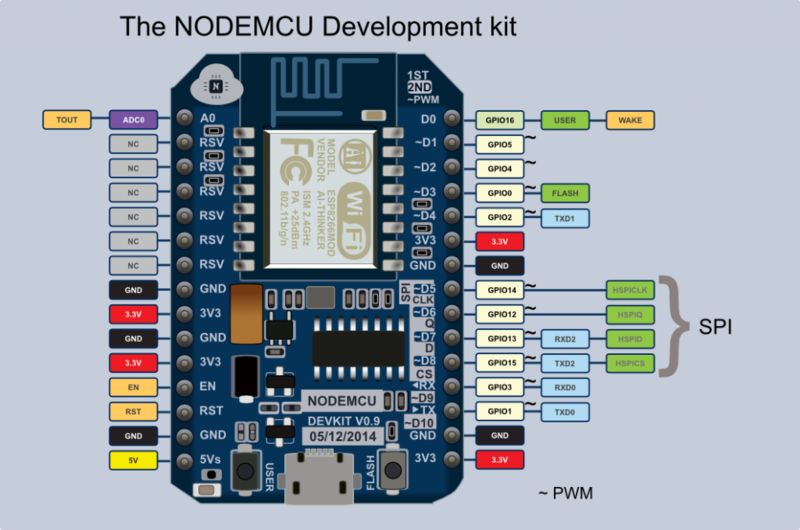 If you are lucky (or smart) enough to have purchased a NodeMCU v1.0 board, you can skip this section, but if you are stuck with NodeMCU v0.9 this may be useful. The first way is to connect the board to the breadboard using female to male Dupont cables. This works, but it’s not quite a neat as the solution provided on lucstechblog, that is making an adapter board with four female headers allowing to insert NodeMCU v0.9 board, and connecting male Dupont cables to the breadboard. Luc uses a stripboard, which makes it quite easier to solder than the perfboard I used, and it took me a little while to get rid of some shortcuts I did during soldering. So I should get myself some stripboards too, as they may be useful in the future. Now that we have taken care of the hardware part, let’s check how to actually use the board. I was expecting some easy to follow documentation, but the documentation on NodeMCU.com is not really that useful to get started, and after searching further I eventually ended up on NodeMCU Firmware Wiki on github which provides more details. However, after connecting the board to my computer via a micro USB to USB cable, while I could see new open ESSID “AI-THINKER_F52E3F” to which I could connect, I had no access to any webserver or the console. So I used minicom in Ubuntu to access the serial program (Putty can be used instead Windows), but again I had nothing. My default settings is 115200 8N1, so I tried 19200 and 38400, and 56700 without any luck. The I decided to flash the latest NodeMCU firmware with esptool as explained on that guide. I did so in a terminal in an Ubuntu computer, with the board connected via USB. You’ll just need to change the second line replacing ROUTER_ESSID and WIFI_PASSWORD by your own credentials to have NodeMCU connect to your WiFi router. The code is set to modify the status for GPIO 0 and GPIO 2 (D3 and D4 pind on NodeMCU board as show in the pinout diagram), so you may also want to modify the code to control the GPIOs required by your project. If you want to clearly understand LUA language, you may want to check out that PDF file provinding details about Lua Language 5.1. So for some reasons, the connection between the baord and my computer is not very stable, and I had another aborted connection when I tried again later. The important point is that you need to check the command went through without errors. 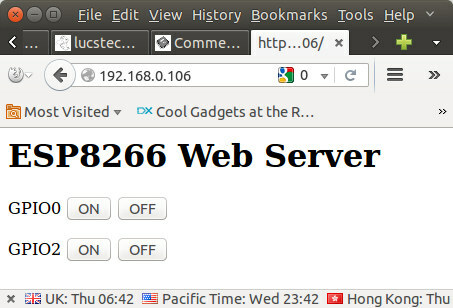 Now open a web browser (I used Firefox) and point it to the IP address (192.168.0.106 in my case). Now you can click on the On / Off button to change the GPIO levels, and with GPIO 2 it will also turn on and off the blue LED on ESP-12 module with OFF (low) = LED on and ON (high) = LED off. The URL will also change accordingly, for example GPIO 2 OFF will show the URL http://192.168.0.106/?pin=OFF2. Finally, after some small challenges, NodeMCU is not that difficult to setup after all. Hopefully, this will help a few people getting started faster. Does somebody know if you can get this dupont cables for connectors of 0.5mm? Why do you want 0.5mm Dupont cables? Smallest I have seen is 2mm, most are 0.1in (2.54mm). 0.5mm is extremely small, so small I have difficulty soldering it. I think the problem is with your code. You set the AP settings wifi.sta.config(“ROUTER_ESSID”,”WIFI_PASSWORD”) which is immediately followed by this print(wifi.sta.getip()) . This procedural attitude is not right with this board. You should hook up a function with wifi.sta.eventMonReg(wifi.STA_GOTIP, yourFunction()) before you make server socket etc. Hope this helps. Very cool, I went through much the same with my doit.am V1.0-clone board (~$10 from banggood), though now I’m just using it as a fancy UART adapter running ESP-Link from JeeLabs. One difference with the V1.0 is it uses a SiLabs cp2102 for the serial chip instead of a ch340, I don’t know if that would have any effect on your intermittent comms problems, though. Any plans to check out MicroPython on the ESP8266? Adafruit have a tutorial here, also. The ESP8266-specific features are a bit disappointingly sparse, there’s no support for SPI or really anything other than GPIO, the REPL is only accessible over UART instead of the network, and “uploading” a permanent script involves recompiling the firmware to bundle the script in, and reflashing. But micropython is getting a lot of support and growing fast, even if the ESP8266 port is kind of neglected, and it’s pretty cool to see that python REPL, I find it easier to use interactively than the LUA one. OTOH, I’m more of a Python user than a LUA user anyway. Another option for breadboarding a wide module like that is to stick two breadboards side-by-side and plug it into both. Google Images gives a bunch of results for STM Discoveries on breadboards like this, e.g. 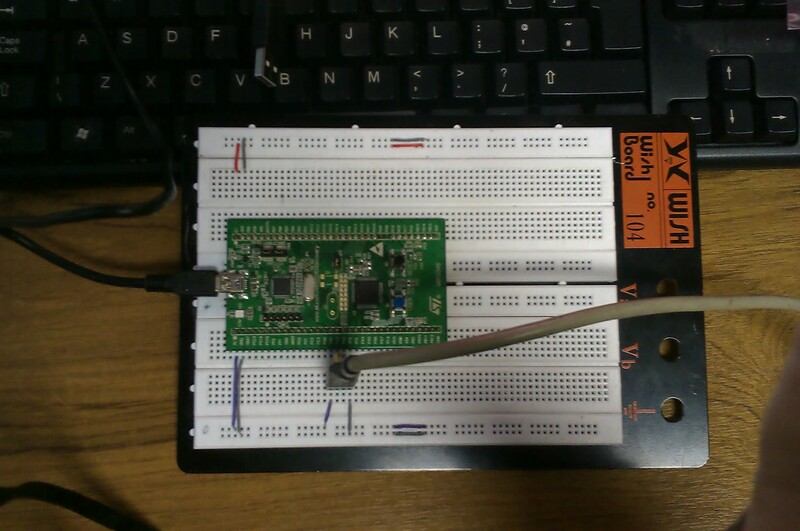 http://eleceng.dit.ie/frank/arm/BareMetalSTM32F0Discovery/serialbreakout.jpg . Some breadboards snap together side-by-side to make this easier, but not all of them end up being aligned to a 0.1″ grid when snapped together, and including the optional power-rails between boards can also throw off the alignment on some breadboard designs. Re: 0.5mm cables, maybe @Roel means 0.05inch (1.27mm) cables? I haven’t really seen those used very often as general purpose headers (but sometimes they are, like on the LPC-Link 2), but they are ultra popular for programming headers. Ever since they became the standard for ARM Cortex debug headers, prices have been dropping *fast* (on ebay, 1.27mm 1X40 and 2X40 headers are below $0.50, vs. ~$5 for just a single 2×5 header a year or two ago) so I’m sure it’s only a matter of time before they start being more widely used. But I haven’t seen any dupont connectors for them, I’m not sure if that would really be practical. Lots of dual-row IDC-connectors on 0.025in ribbon cables, though, for plugging into those Cortex JTAG/SWD ports. If you really want to breakout 0.5mm-pitch pins, I suppose the best will be to get some micrograbber-type probes, and use those to clip to the individual pins. They’ll usually have a 0.1″ male header sticking out of them that you can then use to attach whatever sort of lead you want. But if you need to do multiple side-by-side pins at a 0.5mm pitch, the generic ones at ebay won’t work (only so many can fit next to each other before they can’t reach the pins anymore). If you really need to fit tons of 0.5mm-pitch grabbers side-by-side, it gets expensive. Something like the Pomona 6352 would work, which is $600 for 10. Not to poop at your party or anything, but MXChip now has a competitor to the NodeMCU in a similar form factor, using their EMW3165 module. ARM Cortex M4 & Wifi. Same price point as this board. The ARM core opens up a bunch of possibilities, since the ESP uses the far less common Xtensa core. Search for “WifiMCU”, and you’ll find it. But … this module/board is new enough on the market that the community has not implemented all the wonderful stuff that it generally does, not yet. Plans are to have the Lua interpreter, and the Espruino software, and MicroPython, and also have it function as an mbed platform (should be easy, since it is ARM), and probably also Arduino IDE support. Do you have a way to get WifiMCU cheaper ? I wrote about EMW3165 module a little while ago, but I never noticed WiFiMCU board. They did not had a very successful crowdfunding campaign though. The module itself is $8, so quite more expensive than the sub $3 you can get ESP8266 modules for. Still worth an article, for the extra GPIOs, and maybe it has enough memory to supports HTTPS. I’m trying to debug a router. It’s a main-board with a daughterboard. The connectors are 0.5 mm. I want to break it out to find the serial console. Are you measuring the pitch of the header? The distance from the center of one pin to the center of the next? A 0.5mm-pitch pin header is unbelievably small. The pins themselves would have to be so thin (0.15mm, maybe?) that I don’t think you’d be able to plug them into anything without the pins just bending instead of going in. 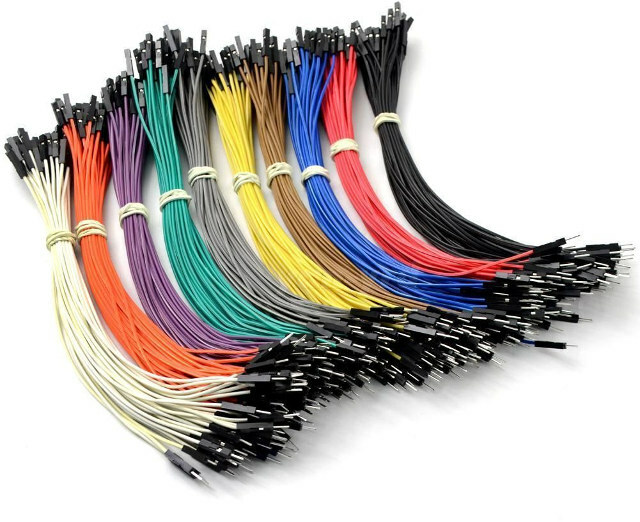 It sounds incredibly exotic and expensive and impractical (because there’s already cheaper, smaller, more common, and more robust non-pin-header connectors widely available as an alternative), and it’s really unlikely to even exist. If your measurement is the width of an individual pin instead, 0.5mm is more believable, and I think you’ll find that the pins are actually spaced at a very common pitch, like 2mm or 2.54/0.1-inches if you remeasure the pitch instead. Those pitches have DuPont connectors easily available. The width of the pin doesn’t much matter when describing a pin header, as pin headers are almost always roughly all the same pin width for a given pitch, no matter who manufactures them. The pitch is what matters. If the pins *are* on a 0.5mm pitch, I suspect you aren’t talking about a pin header at all, but rather something with plastic between the pins (a mezzanine-style board-to-board connector), or a FFC/FPC (flat flex cable) connector. Neither of those types of connectors have pins you can plug a DuPont cable into, instead you’ll have to get a breakout board which has a compatible connector on it which then breaks out each pin of the connector to a 0.1-inch pin. Mezzanine connectors are so varied and unique you’ll have some trouble even identifying the connector, much less finding a pre-made breakout board for it. If it’s a flat flex cable, FFC or FPC breakout boards are easily available on ebay, and 0.5-mm is a very common pitch. You solder a flat flex cable directly to the breakout board and then plug it into the connector on the router. The board then has a 0.1-inch pin header for each of the pins in the flat flex cable. thanks for the answer, you made me a lot smarter. i did indeed measure the pin, not the pitch. The connector is more like a ide connector of a 2,5 inch harddrive but smaller. I don’t have the device with me this weekend, but monday i got it back. Probably the pitch will be 2mm. 2mm Dupont are not that common, but you can get them for cheap on Aliexpress. There are also 2mm to 2.54mm dupont cables available (I got mine at ElectroDragon). That’s handy if you want to be able to connect the other end to something with 0.1″ headers, like a usb-serial device or a breadboard. You’d also need long male-to-male 0.1″ pin headers to convert the female 0.1″ connectors into male connectors for using with a breadboard. Or I assume the 0.1″ ends are handy; I haven’t actually tried plugging a 2mm female dupont connector onto a 0.1″ square pin — would it fit? I advise you to not use any of the outdated releases from https://github.com/nodemcu/nodemcu-firmware/releases. They’re old, unmaintained, suffer from memory issues and contain modules that you probably won’t need (but still eat memory. Use http://nodemcu-build.com/ or the Docker image at https://hub.docker.com/r/marcelstoer/nodemcu-build/ to build your own custom firmware from the NodeMCU dev branch. Disclaimer: both services are from yours truly. for the 0.9 dev kit, span it over two of the power supply strips, for the 1.0 use a single power strip. I’ve played a bit more with NodeMCU. The serial connection stability issue is because I’m going through a USB hub, and if I connect it to my computer directly it works OK.
I’m controlling an AC water pump with it now. Still using firmware 0.9.6, as firmware 1.4 (master) and 1.5.1 (dev) do not work. The main issue is reconnecting to WiFi is the router is turned off and on. I think it can be done with callbacks (wifi.sta.eventMonReg), but firmware 0.9.6 does not seem to support it. Hey, thanks for this great article. If only I had found this yesterday when I got my NodeMCU, would have saved me couple of hours :D. Documentation is indeed pretty hard to find compared to Arduino stuff. Thank you for the guide! It help!! Can we do serial communication between NodeMCU and Arduino using usb cable? Thanks for the tuto, but when I disconnect the pc to put it elsewhere by feeding with an external battery it does not work. I’ve had a NodeMCU running on its own to control a relay for nearly a year (Now replace with Sonoff TH). What happens if you connect it to a USB power adapter, do you have the same problem as with a battery? If you reconnect the board to the PC, can you still see your init.lua file? For v0.9 boards You can take two breadboards and connect them side by side, and it works fine. You are closing the connection directly after sending. This is not working for me, because the connection is closed too early. Its better to set a callback, so the connection is closed when the transfer is finished. Maybe it depends on the firmware version. Thanks for your helpful posting.